Apple is not only guiding third-party accessory manufacturer packaging, it’s also letting us all know how it tests those products. 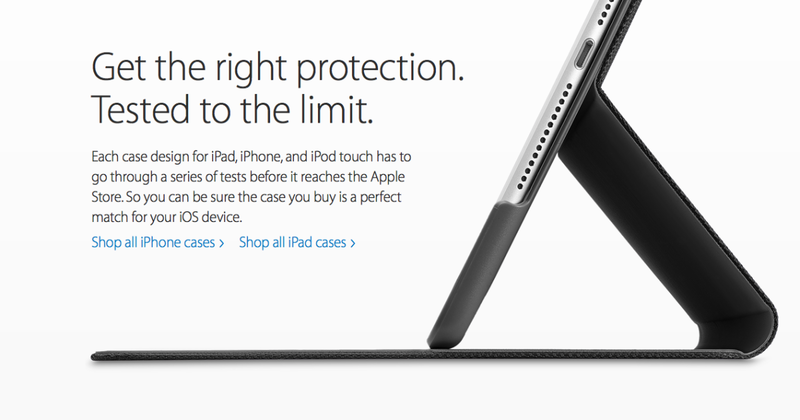 A new page has been added to Apple’s online store, highlighting cases and covers Apple has tested and deemed worthy of covering your iOS devices. Cases for the iPad, iPhone and iPod are all tested to ensure they protect your phone without interfering with the various components and sensors found in or on your phone. Apple even runs drop tests to make sure “the design is strong enough for day-to-day use.” Tests are also done to make sure cases don’t hinder your cellular or Wi-Fi signal, and even tests Apple Pay isn’t sidelined when you have a case on. As Mac Rumors points out, these tests were already part of Apple’s MFi program. Launching a dedicated page highlighting “Apple tested cases” is another step towards tighter control over the iOS ecosystem, and a more open look at just what Apple considers when testing products.